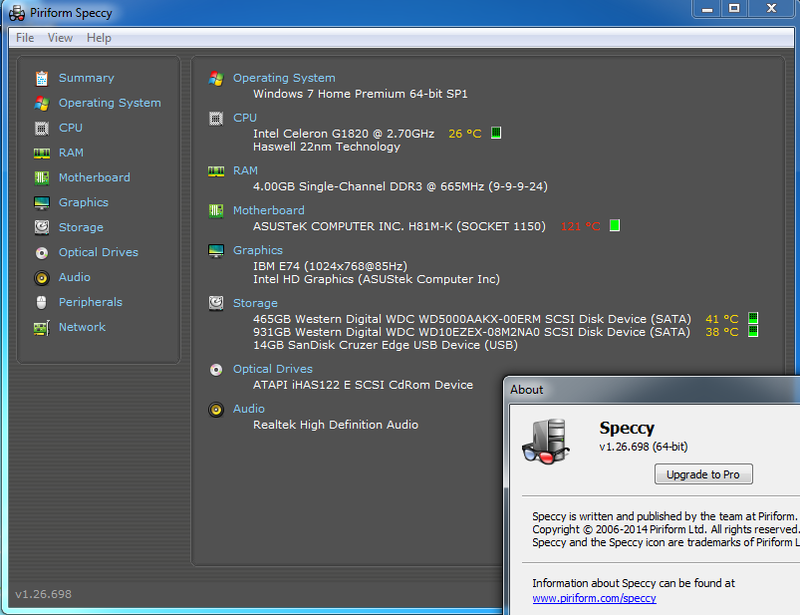 I'm running an ASUS Z87-K mobo, and the latest Speccy build(v1.24) is displaying its temperature at 115°C. I've reinstalled the latest two versions, and they both showed it at the(expected) 28°C. Uninstalling and reinstalling v1.24 didn't fix anything, so I'm back to using v1.23 at the moment. Any information or solutions are appreciated. Same bug here on ASUS H87-PLUS mobo. but whenever i check the temps with speecy it keeps displaying 113 °C which is the max temperature the motherboard can handle. What do you think it's causing the problem? I just made a topic and i didn't notice, it was already posted! Hi, thanks for letting us know. We will look into it. always Motherboard shows higher values over CPU, which is not plausible. The motherboard temperature is reading 128 degrees Celsius. Is there a solution in the works or a temporary fix for this 'bug'? 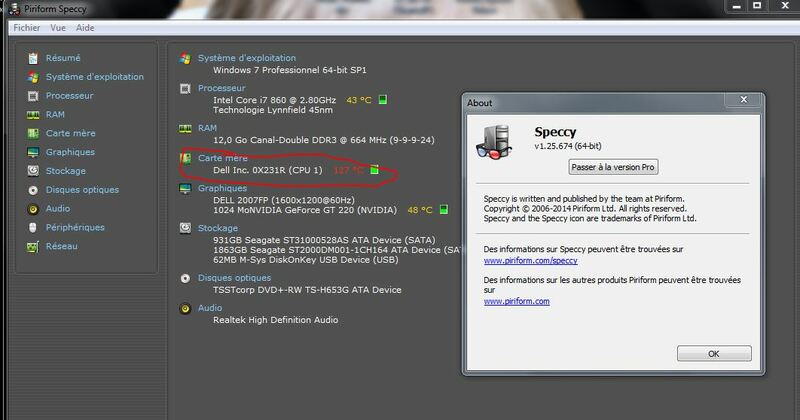 - I'm assuming it's a software flaw since Speccy is showing similar temps from various board manufacturers and OS versions. 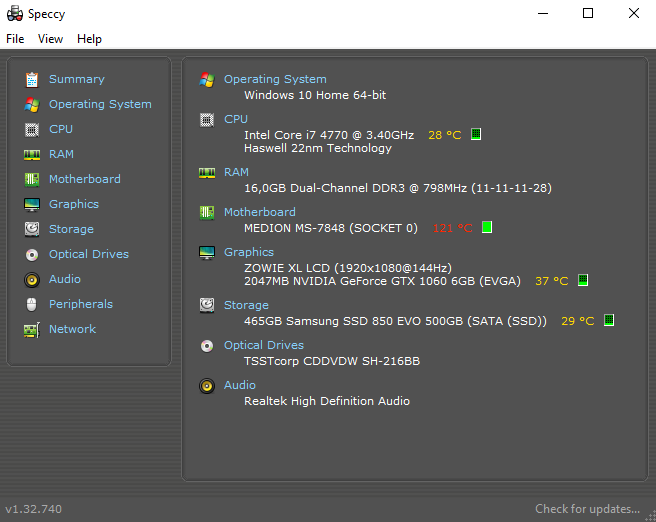 CPUID Hardware Monitor (v1.24.0 driver version 136) also reports 128 degrees Celsius. Thank you for your time, I really enjoy this software. After being on for 2 minutes, Speccy reports a CPU temperature of 28°C, motherboard temperature of 118°C, and WD HD temperature of 26°C. Your programming work is greatly appreciated. Interests:NASCAR, photography, woodworking, sci-fi, participating in Sevenforums.com to help others as Britton30 there. I have two ASUS boards, Sabertooth Z77 and a P8Z68-V Pro Gen3 and version 1.24 shows a normal temp, 30C-34C. I suspect it is some Haswell bug. 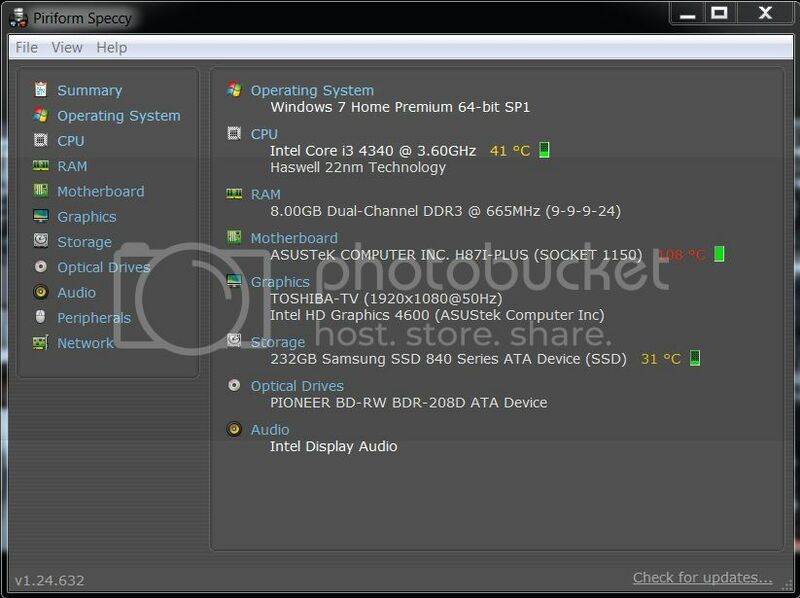 There are many benchmark programs which don't play well with Haswell too. I initially bought a Sabertooth Z87 and i7-4770K but returned them in favor of Ivy Bridge. Too hot, too much trouble. A HGaswell refresh in rumored to be in the works. I am happy to report that v1.25.674 does report the mother board temperature correctly. When I go in Windows, the temp rise approx up to 75oC-80oC... It's almost impossible... I have a super good airflow, good fan... I really beleive Speccy don't read the good information. The mobo is a ASUS M11BB, cpu is a AMD A8-5500. I really think is only a bad reading! For info, bug appears to exist in Speccy v1.26.698 on Asus H81M-K mobo. Motherboard temp reported at 121C. CPU reported at 26C, HDDs around 40C. No issues with PC operation. Asus B85M-K still has "118" degrees C.
that particular bug has now been known about for around 2 years - so you can either read into that 1) it can't be fixed or 2) they don't care. but you wouldn't know since no official word from high has been given. Piriform has recently hired a new, junior Product Manager, so maybe this will be part of his new duties - but again - purely speculation on my part. I have had this bug for a while already, but with a different motherboard though. No clue what the differences and similarities are with those two motherboards.